A modern and historical country boasting great roads for drivers and there are plenty of things to do in Turkey while you have your hire car. Make the most of your holiday by following our guide to getting the very best experience while visiting the tourist sites in Turkey. If you’re taking a driving holiday keep your plans flexible as you never know what you are going to see as there are so many places of interest in Turkey. Driving the well maintained roads of this beautiful country is one of the best things to do in Turkey and allowing time for some unplanned stops en route will only enhance your experience. With plenty of roadside stalls selling fruit and many other things including souvenirs and local produce the chances are you are going to want to stop, and more than once. When you are looking at what to visit in Turkey remember that there will plenty to see along the way. Keeping your journey, relatively, unplanned will mean you will see some tourist sites in Turkey that you may well have missed by keeping a tight schedule. When you book your hire car be sure to look at the wide range of extras and especially a SatNav to make your journey go as smoothly as possible. When you are considering what to see in Turkey put them into your GPS device and avoid some of the dirt tracks that you may well be guided along by locals who are familiar with the area. Although the sign posts are very good in Turkey and are plentiful it is still a lot less stressful for drivers who are unfamiliar with the country to have the assurance of a SatNav device. You can book a device with your car at, www.goldcar.es and buy choosing a SatNav when you reach the ‘extras’ section. The roads in Turkey are superb and its motorways are new, well maintained and not full of traffic! If you get the chance of the the best things to do in Turkey in a car is head along from Asmara to Sinop, the Black Sea coast, and enjoy the narrower windy roads that head around the hills offering fantastic views over the sea, certainly one of the roads you should consider driving and a natural place of interest in Turkey. The motorways, as I said, are very good and will get you where you need to go as the modern network now covers the majority of the country. But for me, it’s the smaller roads that allow you to see the real Turkey and along these coastal roads you will often be the only car on the road, peace and tranquillity and ocean views! With so many tourist attractions in Turkey it’s easy to fall into the trap of driving for too long to try and get somewhere. If you are planning what to do in Turkey allow for plenty of stops along the way. There are some wonderful tea houses throughout the country and they are very welcoming to tourists. Many are near to tourist sites in Turkey but the best are in the small towns and villages that you will pass through. Take a walk to stretch your legs and refresh yourself for the next stage of the journey and by walking around the country’s towns and villages you’ll see some of the best, and least busy, places you should know about in Turkey. Make sure you have all the correct documents for yourselves and your vehicle and obey the road laws as the Turkish police are active on the roads and often use radar guns for checking that speed limits are not being broken. And they also hold random stops to have a look at your papers and make sure everything is in order. Be aware also of any parking restrictions in the towns and cities as it is easy to misunderstand signs that may well have time periods when you can park but a little later it may be illegal! Always check. Also parking wardens will slap a ticket on your screen the moment your park in the ‘wrong’ place. Tourist attractions in Turkey, like many countries, usually have their own parking areas so its best to use those if you have any doubts. Toll charges can be automatic or you will have to stop so if you are going to go through many tolls it may well be an idea to buy a pass that will allow you to just drive through. 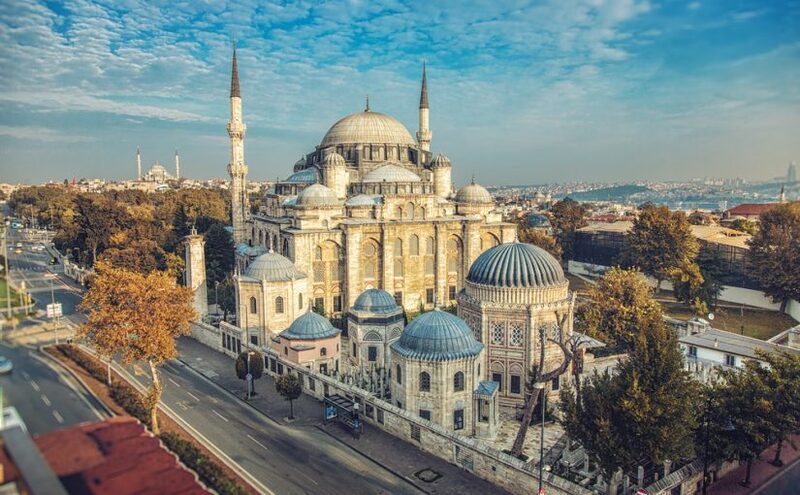 The land of Sultans, Turkey is a fascinating nation that borders eastern Europe and western Asia with has its historical and cultural history dating back to ancient Greek, the Roman, Persian, Byzantine and the Ottoman empires. There is so much to see and do in this diverse country from the thoroughly modern city of Istanbul with its trendy shops and boutiques to the Topkapı Palace, the former home of of the nations ancient rulers, the sultans. When considering what to visit in Turkey, Ankara, the country’s modern capital is a must. Other tourist attractions in Turkey include the amazing Cappadocia, entire cities carved into ancient volcanic rock formations and the Pamukkale Water Terraces where Roman ruins top white travertine terraces formed by ancient hot springs. Another of the places you should know about in Turkey is Basilica Cisterns of Istanbul, a marvel of Byzantine engineering under the streets of Istanbul. So much to see and what better way than behind the wheel of your hire car. If you want to travel to Turkey you have to know how. Here it is a driving guide to enjoy your holidays to this exotic place.